André Brégégère is a composer, music scholar, and educator, living in Queens, NY. In recent years, his music has been performed in major venues including Carnegie/Weil Hall and Symphony Space by leading ensembles including Cygnus, Second Instrumental Unit, MIVOS Quartet, Cadillac Moon Ensemble, and Transit; broadcasted on WQXR, WNYC and WPRB; and released on the label New Dynamic Records. As a founding member and co-director of Dr. Faustus (www.drfaustus.org), he is also an active advocate for new music, overseeing the commission and performance of more than twenty works by emerging composers since 2008. Mr. Brégégère is an Adjunct Professor of Music at William Patterson University and Queensborough Community College. 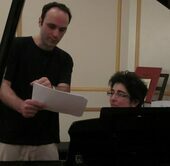 He received his doctorate in Composition from the Graduate Center, CUNY, under the supervision of Joseph Straus. “The Serial Concept In Pousseur’s Votre Faust.” Oxford Handbook of Faustian Music. Ed. Lorna Fitzsimmons. New York: Oxford University Press, forthcoming (11/25/2018). “Echoes of Exile: Genocide and Displacement Studies in the Undergraduate Music Curriculum,” (co-authored with Mirna Lekić) in Humanitarian Pedagogy Across the Disciplines: Reflections on Mass Atrocity Education in the Community College Context, edited by Amy E. Traver & Dan Leshem. London: Palgrave Macmillan, 2018. En route, for chamber ensemble, released on the CD Atlas, New Dynamic Records, 2012. “Icare apprenti: Henri Pousseur, Serialism and the Open Work,” 17th International Music Theory Conference: Principles of Music Composing, ratio versus intuition, Vilnius, Lithuania, November 8-10, 2017. _____________, Performing Indeterminacy: An International Conference, Leeds, UK, June 30–July 2, 2017. “Some Thoughts on Maximally Smooth Voice Leading Among Pcsets and Set Classes,” Society for Music Theory (SMT) Annual Meeting, Arlington, VA, November 2–5, 2017. _____________, Texas Society for Music Theory, Houston, TX, February 24–25, 2017. “On Votre Faust,” Guest Lecture, SUNY at Buffalo, NY, October 12, 2017. “Icare obstiné: Pousseur, Serialism, and the Open Work,” West Coast Conference of Music Theory and Analysis, Victoria, BC, April 21–23, 2017. “L’Apothéose de Rameau: A Survey of Henri Pousseur’s Network Technique,” Society For Music Theory (SMT) Annual Meeting, St. Louis, MI, October 29–November 1, 2015. _____________, 2015 meeting of the Music Theory Society of New York State (MTSNYS), Binghamton, NY, April 11–12, 2015. ______________, New England Conference of Music Theorists (NECMT) 30th Anniversary Conference, Boston, MA, April 24–25, 2015.